Can Social Entrepreneurship Tap India's Demographic Dividend? India is a young country. At present, 66% of India's population is under the national average age of 26 years. In the next decade and a half, more than 13 million Indians annually will enter the workforce for the first time. By 2030, India is expected to have 28% of the world's working population, a billion-person labour force, and the largest population in the world at approximately 1.4 billion citizens. But companies - be it public or private - still find it tough to employ people! The reason behind this is the existence of a significant "skill gap" between the supply of skilled labour and the demand for skilled candidates. Reports suggest that only 2% of India's existing workforce has undergone formal skill training, and millions more are devoid of any training at all. The Indian Government is attempting to address the problem by working to train and skill 500 million people by the year 2022. But can we all just leave it to the government to provide training and skill to India's workforce? The answer is a big NO! It is also the duty of individuals with sufficient resources to come forward and develop scalable businesses which can impart training and skill to India's labour force. This is exactly how the winners of the Hult Prize PAN India Initiative plan to provide meaningful employment opportunities to millions in India. The team Nautical-Part representing Indian Institute of Management Ahmedabad (IIMA), India's foremost business school, aims to lift the underprivileged to a better life by giving skill-enhancing training. The team has built a model to connect the trainee and trainer via phone, Apps and a website. The trainee can learn from the trainer, and they rate each other once the training has been imparted. The team Nautical-Part is also working on developing an ecosystem to provide jobs to those who have completed the training successfully. In the second stage, the idea is to connect with institutes such as government-run industrial training institutes, polytechnics and use them during the night for training purposes. The team plans to make this business model self-sustainable and scalable so that millions can be trained at the cheapest cost. 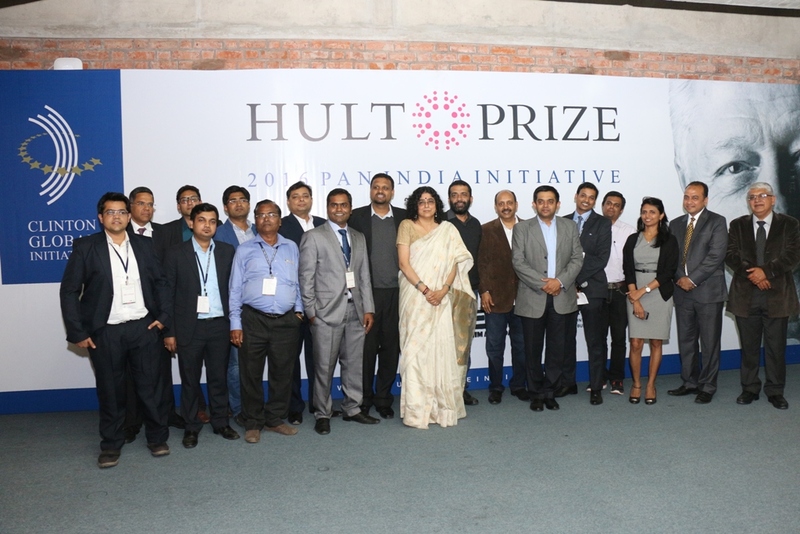 What is the Hult Prize Pan India Initiative? Today "Hult Prize" is world's largest student competition focused on social entrepreneurship, one of the top idea-sourcing platforms across the globe, and works in association with President Clinton's Clinton Global Initiative. The winners of the annual event get one million dollars in seed funding to launch and scale their social enterprises. Hult Prize PAN India was launched to help students from India participate in this global competition and solve some of the world's most pressing social issues. "With NanoHealth from the Indian School of Business winning the prestigious 2014 Hult Prize, this year we have witnessed a huge change in the mindset of students of top institutes in India, and there is a huge spurt in the participation from India in this wave of social entrepreneurship" said Raj Bordia, the Director of Hult Prize India. The Hult Prize PAN India Initiative has witnessed more than 300 innovative social business ideas from India's top institutes in response to this year's challenge, "Double the income of people living in crowded urban spaces by better connecting goods, people, services and capital." More than 150 top colleges from India participated, and 30 of the best ideas pitched in front India's finest jury at a mega event on the 9th of January 2016, held at the IIMA campus. This was the largest social entrepreneurship competition to be ever held in India, and in the next few years the goal is to have students from the entire Indian subcontinent to participate in this competition. With the top minds from around the country in this together, there is no doubt that waves of social responsibility and sustainability will spread across India, with rejuvenated focus on solving prevailing and pressing issues within India and around the world.